Joe Biden is Barack Obama’s mildly retarded uncle who lives in the basement. You bring him up for Thanksgiving and to go to the dentist, but the rest of the time, he’s a cellar dweller. Because you just don’t know what he’s going to do or say next. Like at a rally in Scranton, Pennsylvania, (his home town) on Monday for Hillary Clinton. In doing so … he identified the man holding the nuclear codes to the entire crowd. Well, if there was any national security issue with publicly identifying the man who could single-handed blow us all to hell, it’s too late now. 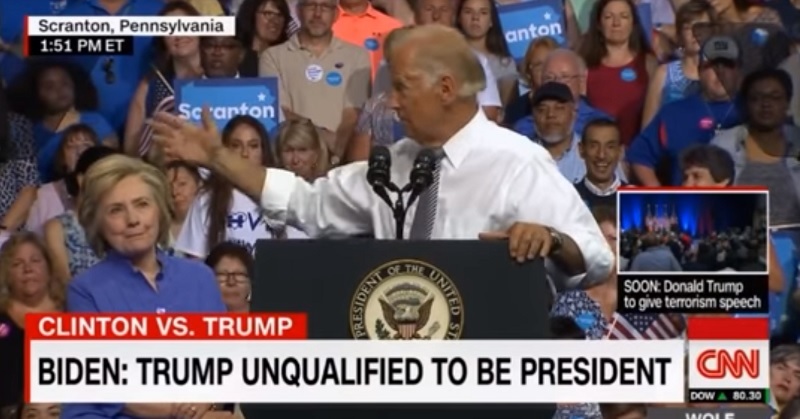 So as an example of how Donald Trump can’t be trusted to know the nuclear codes – because they’re a heavily guarded secret – Vice President Joe Biden identifies the man carries around the nuclear codes. Fantastic. And classic Joe Biden. Joe Biden might have made a disastrous president. But he certainly wouldn’t have been a boring president.